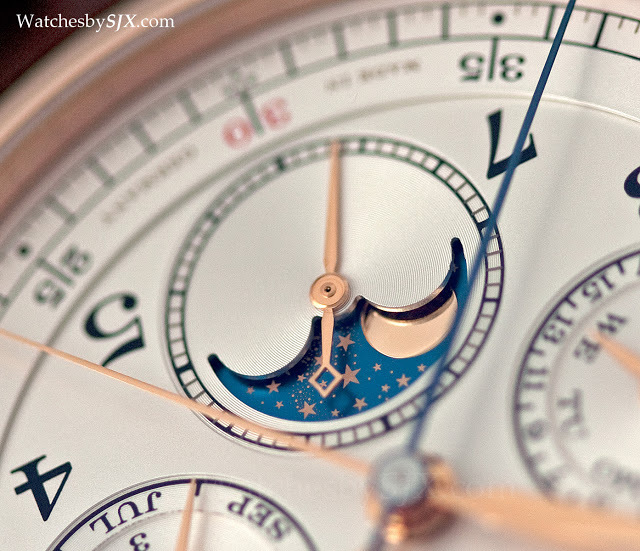 The watch is study in contrasts. 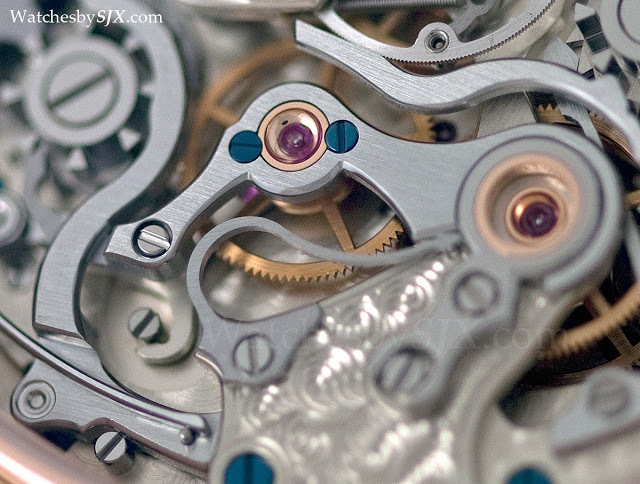 It has a symmetrical, conservatively styled dial with four sub-dials, giving it a pocket watch aesthetic, but the movement is unusual in layout and construction. 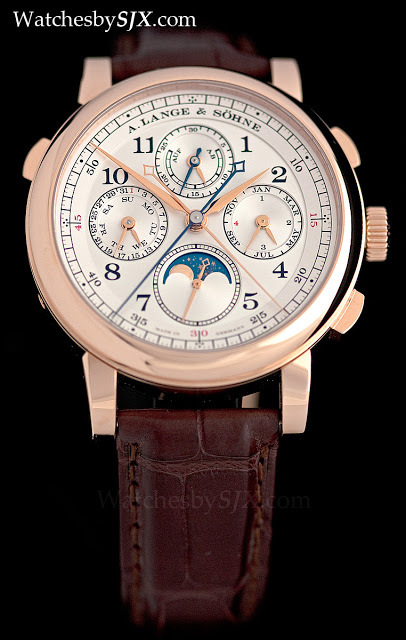 Loosely based on the movement of the Tourbograph, the calibre of the 1815 Rattrapante Perpetual Calendar is distinctly different from other Lange chronograph calibres. 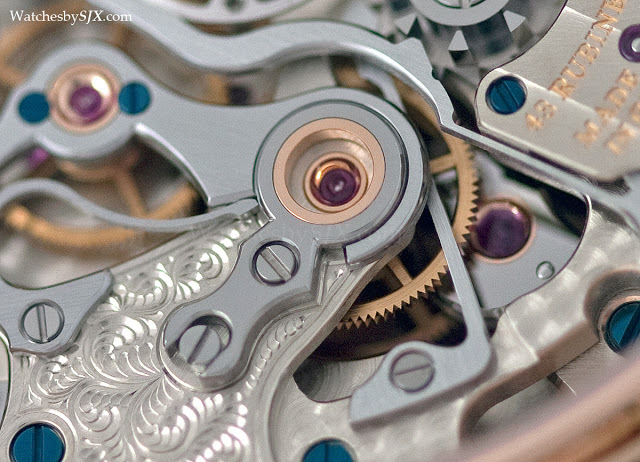 It might take a moment to register, but look at a photo of the L101.1 inside and compare it with the Datograph movement. 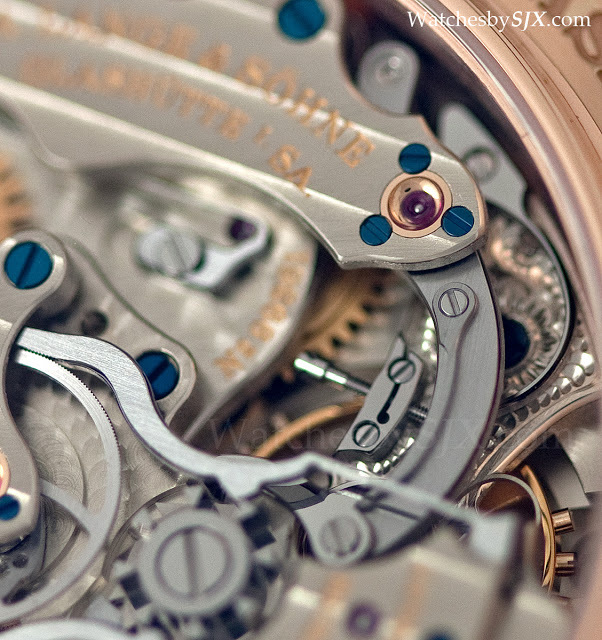 The first obvious difference is the width of the chronograph levers. 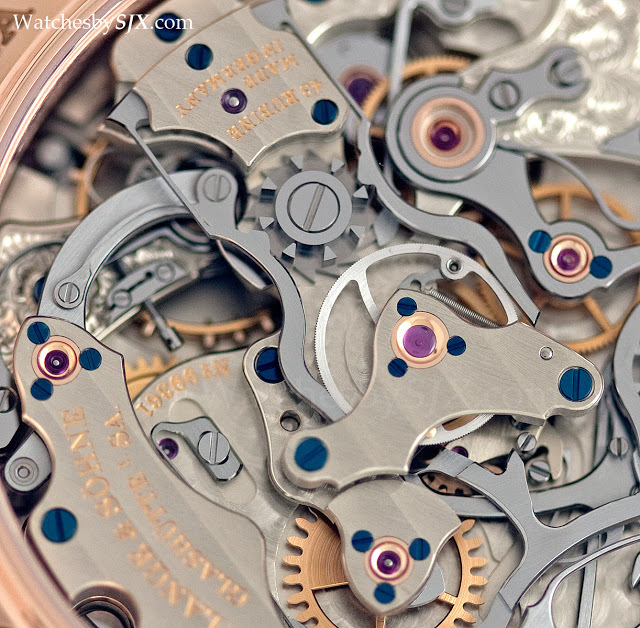 They are all wider and seemingly flatter than those in the Datograph movement, which was eminently classical in its design. 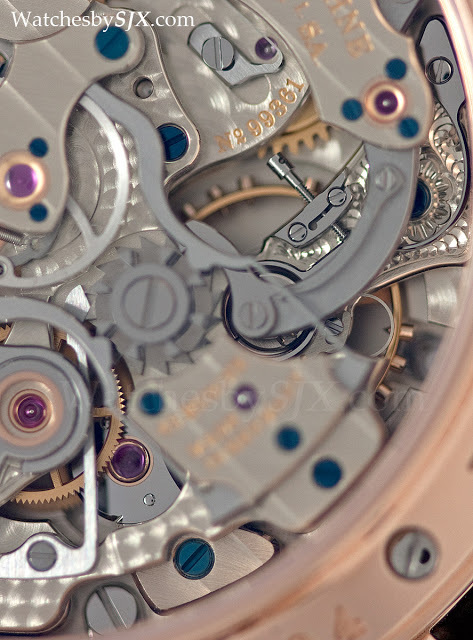 This was done to minimise the height of the movement, so as to eliminate play in the rattrapante hand by reducing the length of the split seconds hand axis which has to extend from the back of the movement to the hands. 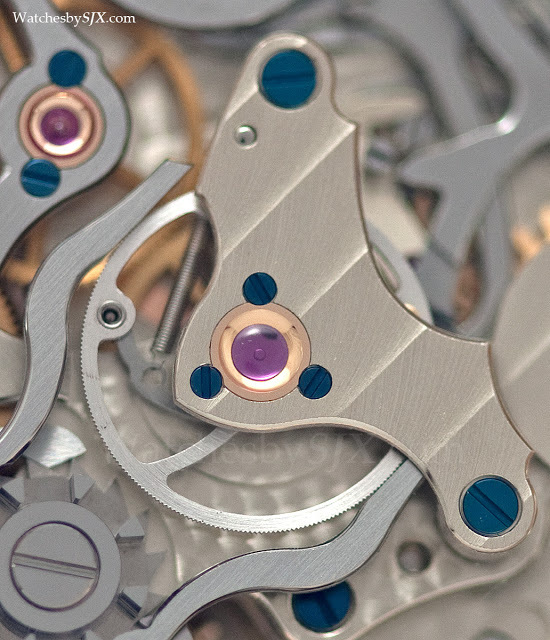 Flat levers such as this can also be made via wire erosion, which is more efficient. 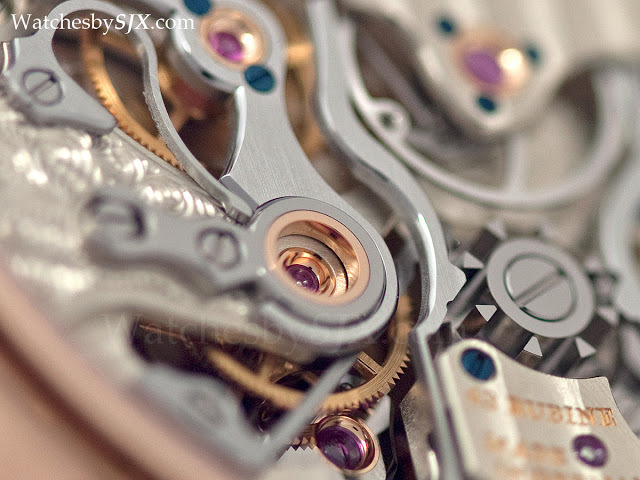 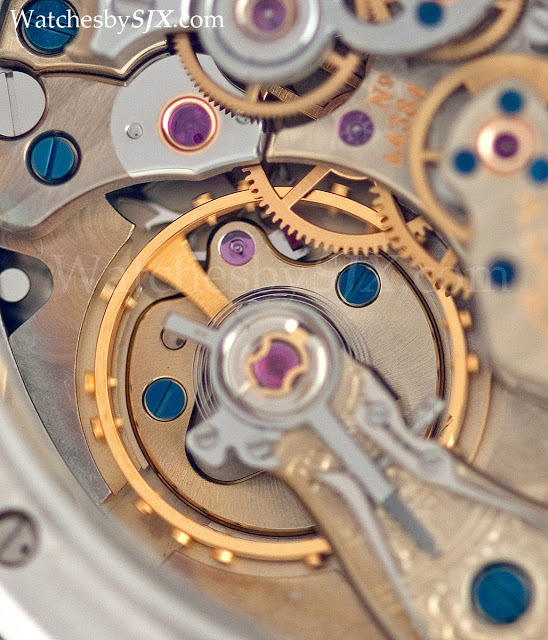 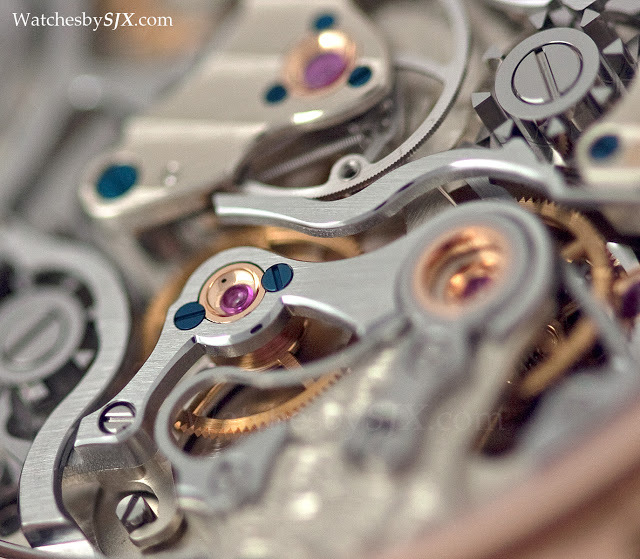 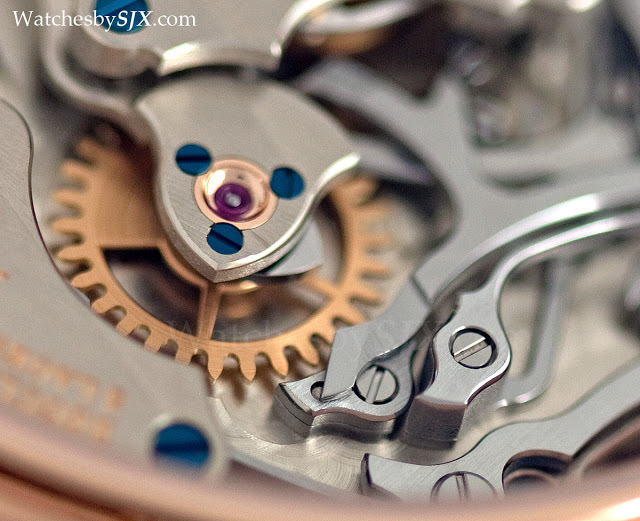 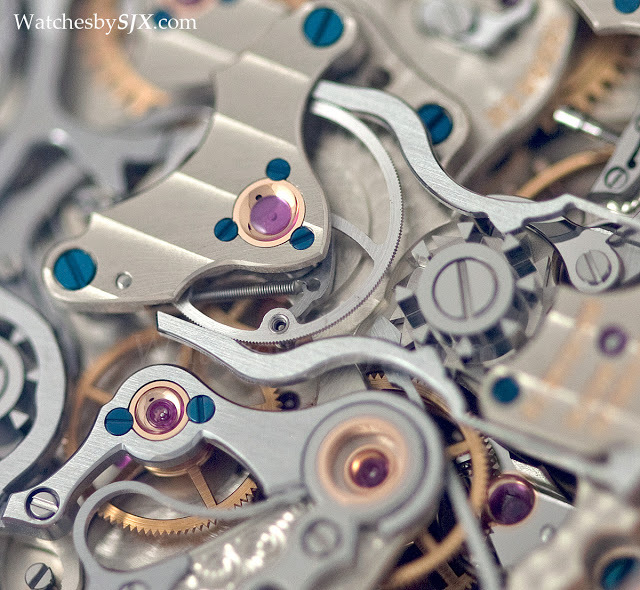 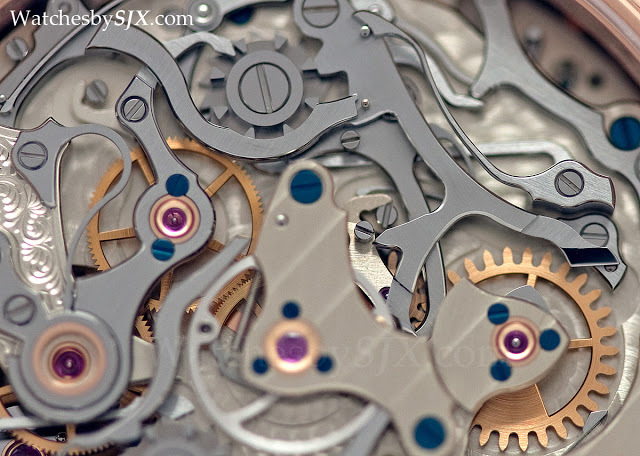 Another notable element of the movement construction is the location of the column wheel, it is much closer to the chronograph pushers than in the Datograph. 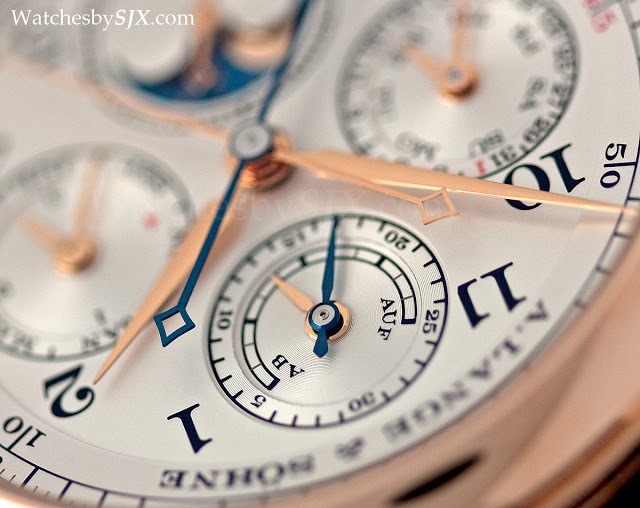 The column wheel in the Datograph is at six o’clock, while on the 1815 Rattrapante Perpetual Calendar it is at three o’clock, in between the pushers. 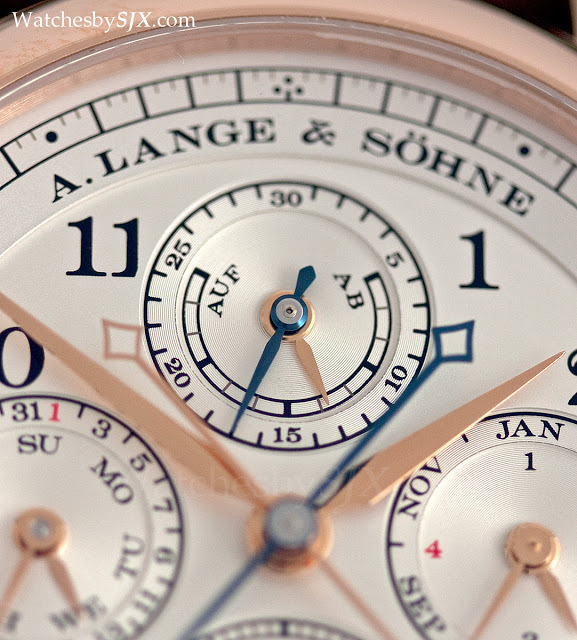 To achieve this Lange used levers that form a “Z”, rather than the conventional “L” or shallow “C” shape. 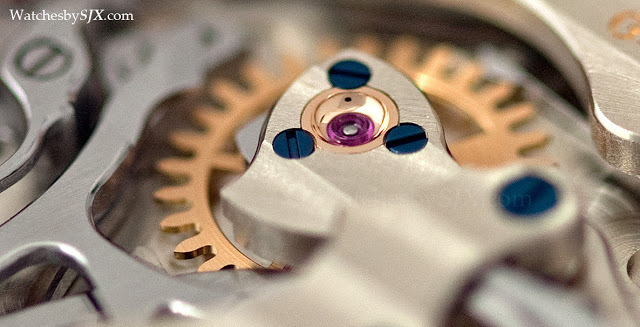 In addition, the rattrapante uses a more mundane spring, rather than a cam, for its reset function. 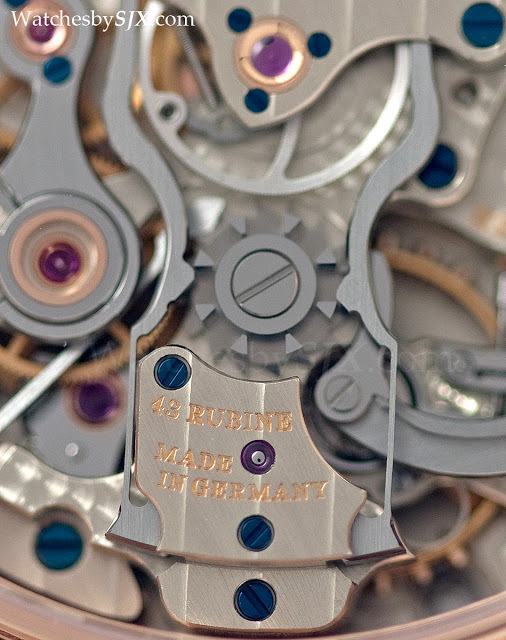 This brings to mind Richard Habring’s condensed split seconds mechanism, built on a Valjoux 7750, he developed for IWC and then on his own with Habring². 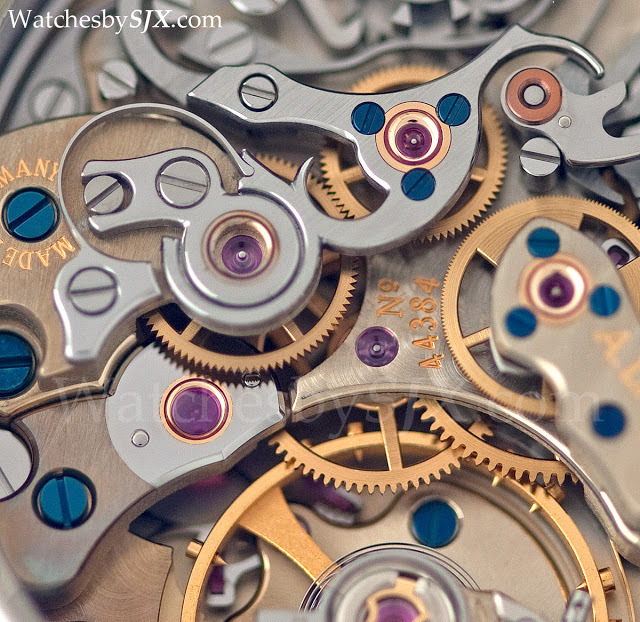 All of this means the movement, and rattrapante mechanism in particular, is compact. 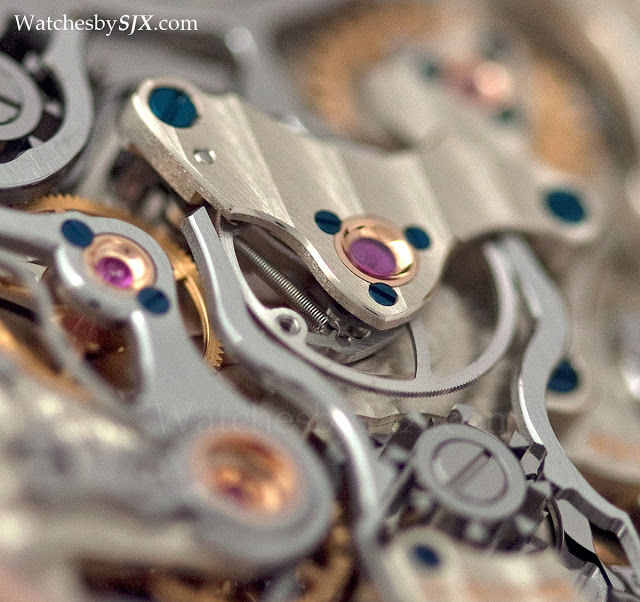 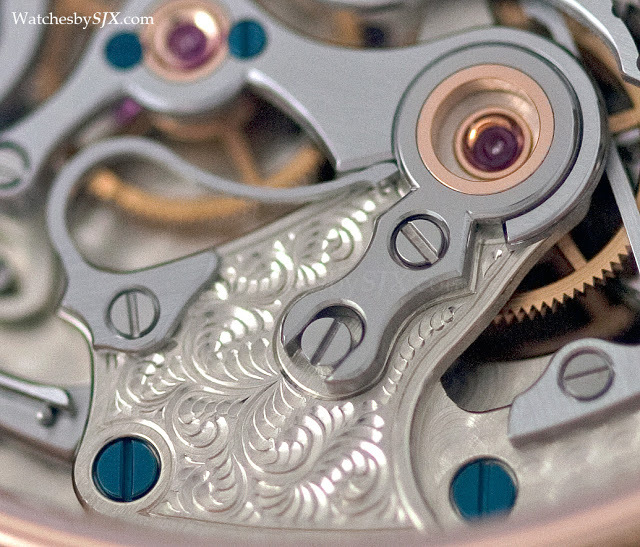 The movement is only 9.1 mm high. 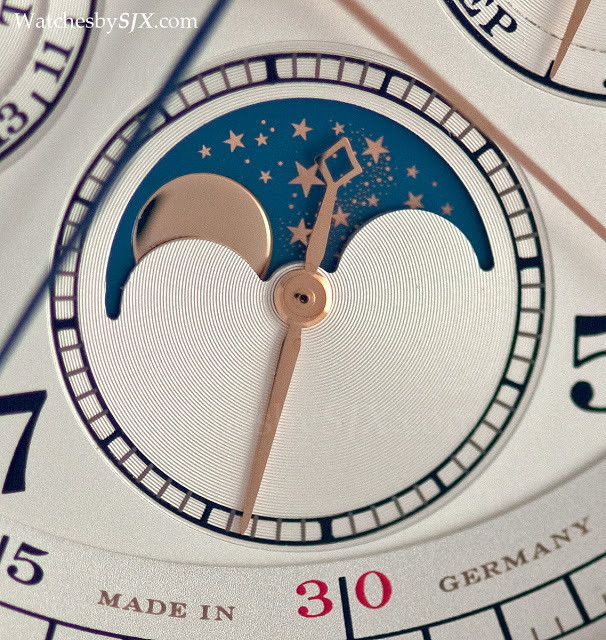 In comparison the CHR 29-535 PS Q of the Patek Philippe Ref. 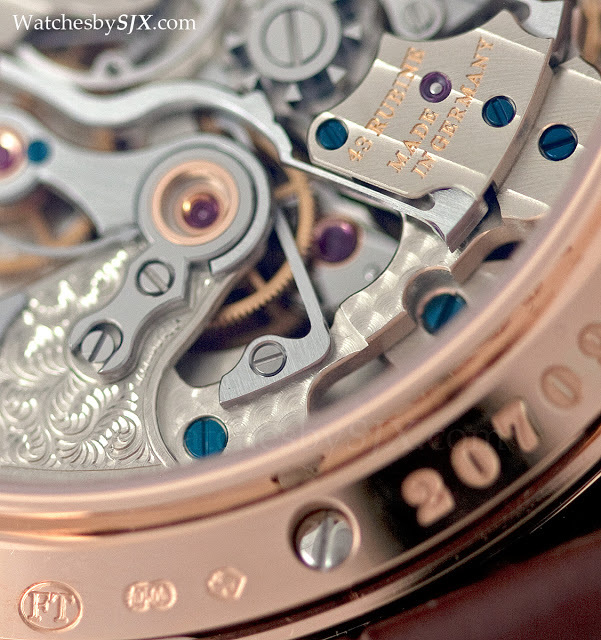 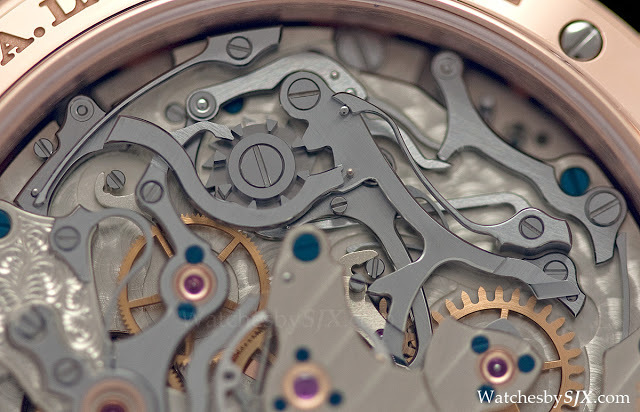 5204P is 8.7 mm high, and Patek is much more adept at thin, complicated movements than Lange. 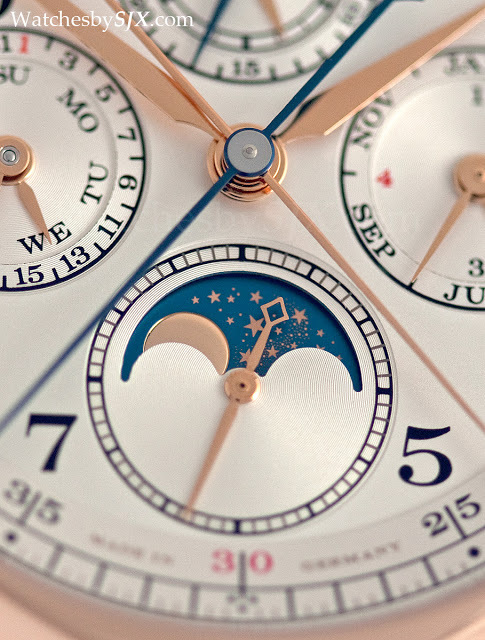 That translates into reduced case dimensions: the 1815 Rattrapante Perpetual Calendar, which as its name implies is a split-seconds chronograph with perpetual, measures only 14.7 mm high. 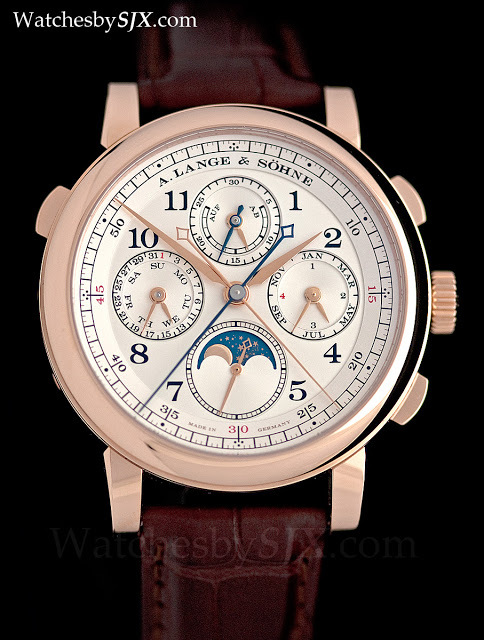 Compare that to the Double Split, which only has a double rattrapante, at 15.3 mm and the Datograph Perpetual, which is a chronograph with perpetual calendar. 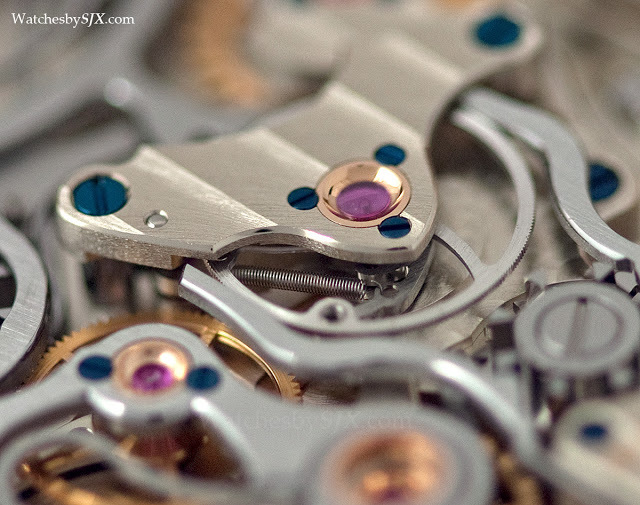 at 13.5 mm. 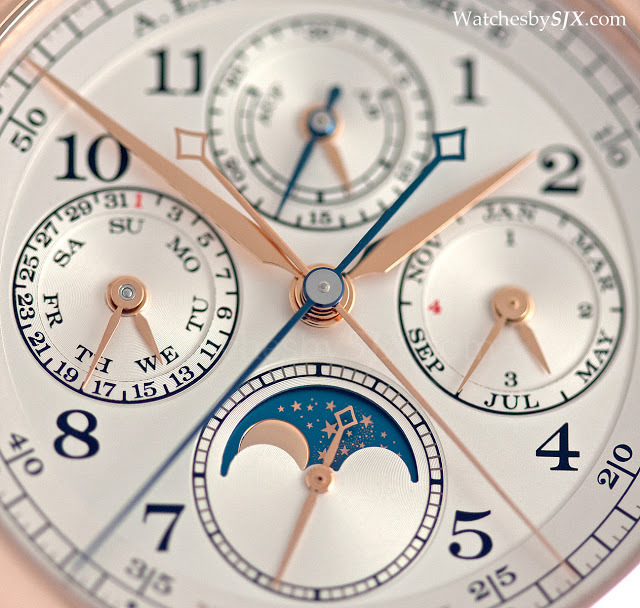 And it is only 41.9 mm in diameter, while the Double Split is 43.2 mm and the Datograph Perpetual 41 mm. 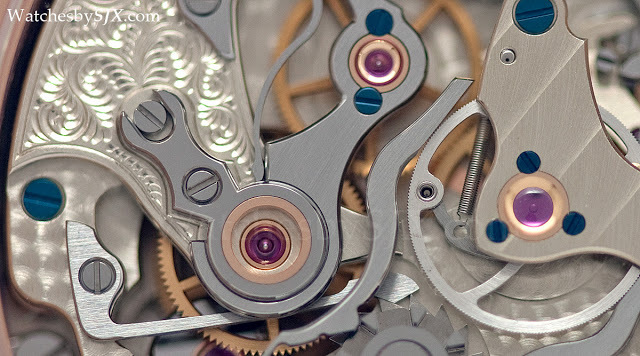 Though functionally superior, the visual appeal of the wider and less elegant levers is not as great as that of thin but thick ones. 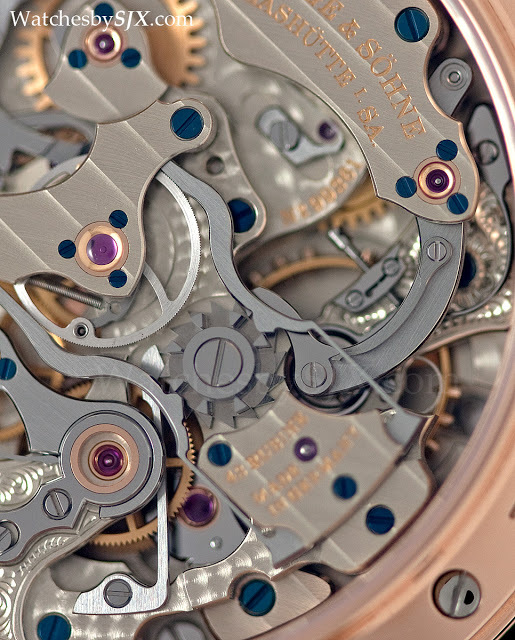 This movement is beautiful, but not as attractive as that of the Datograph or Double Split. 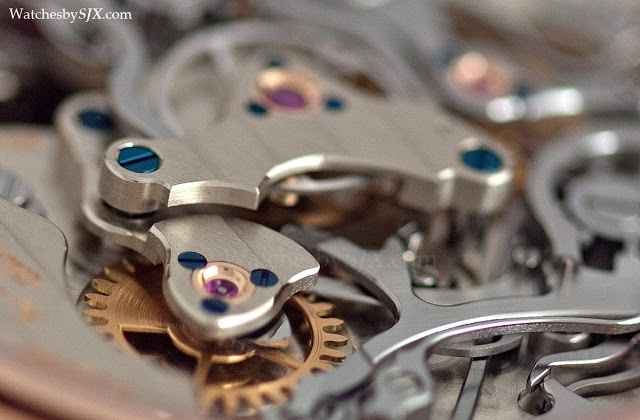 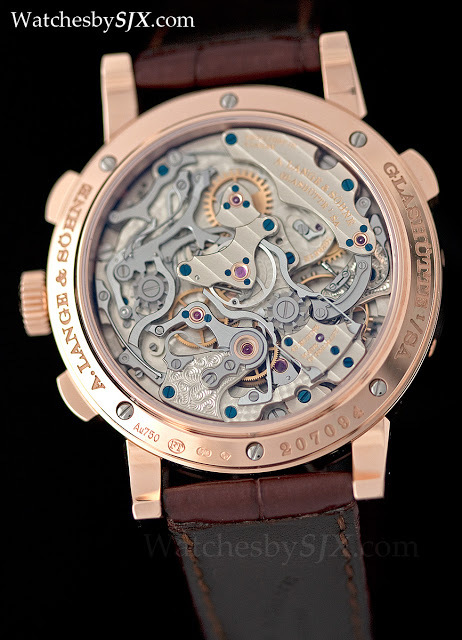 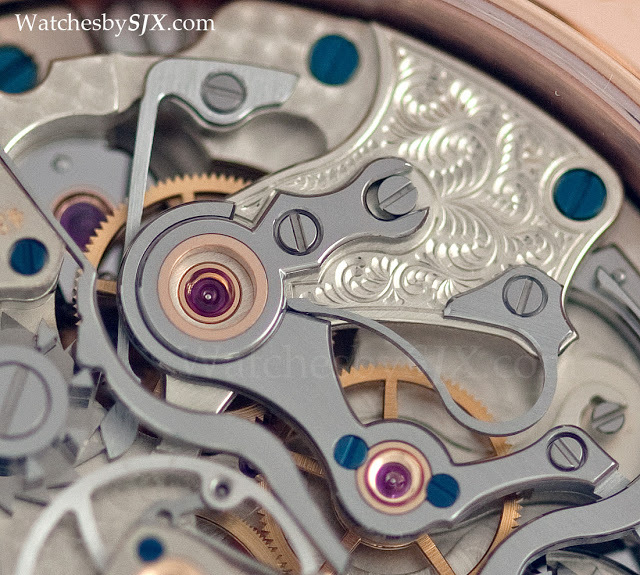 Despite the modern approach to construction, the movement finish is still in typical Lange style – superb. 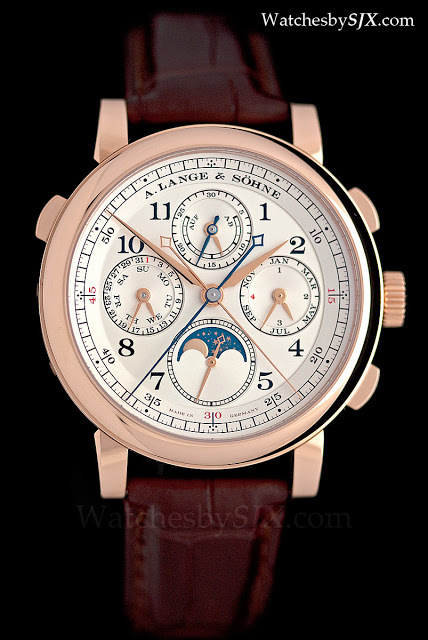 Lange movements in the past have tended to be solidly built with lots of traditional styling details, but this is different. 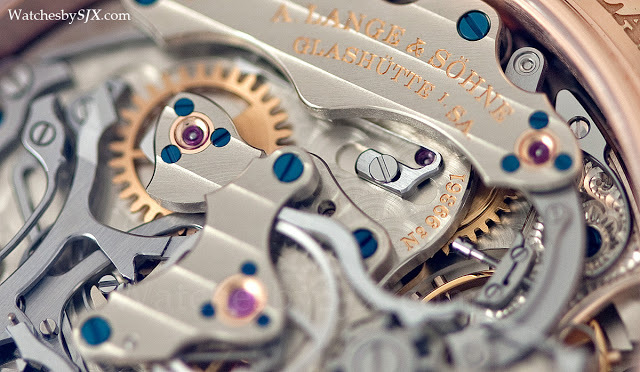 The movement construction is different and well thought out, and raises interesting possibilities for future calibres from Lange. 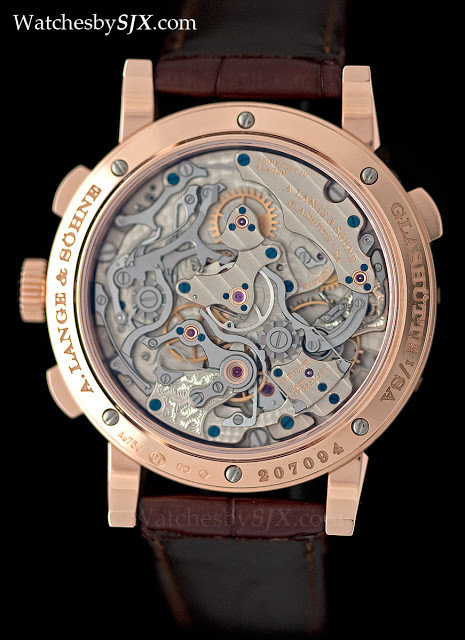 This retails for EUR160,000 (about USD213,500) in pink gold and EUR180,000 (equivalent to USD240,200) in platinum. 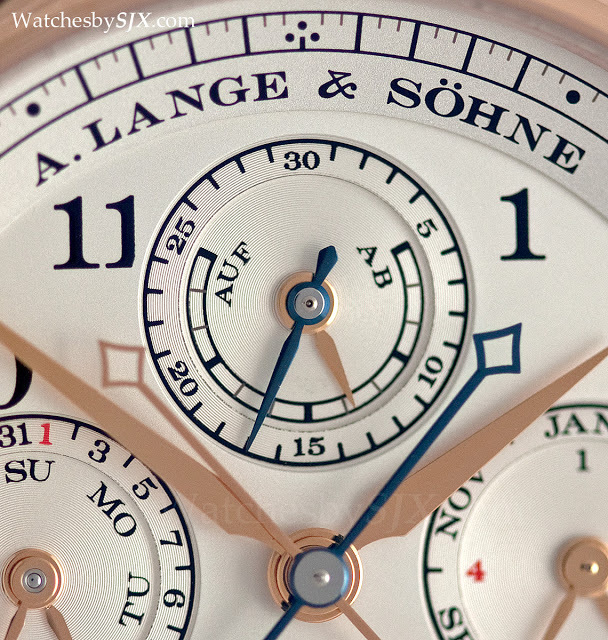 Remember to check out of the rest of the Lange SIHH 2013 collection in my photo report. 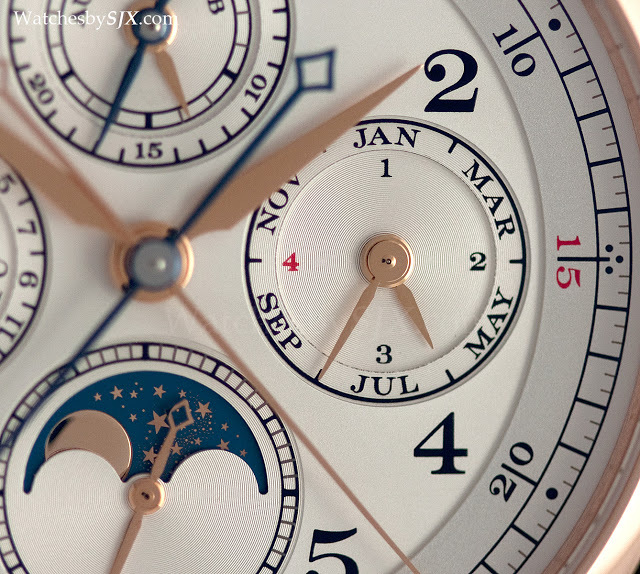 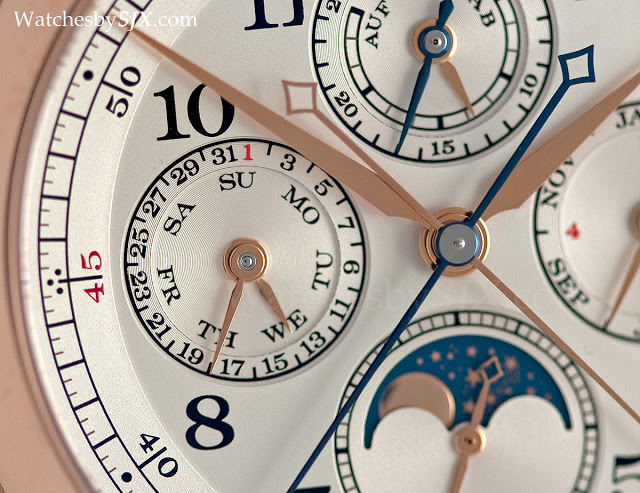 Enjoy the rest of the 1815 Rattrapante Perpetual Calendar photos below. 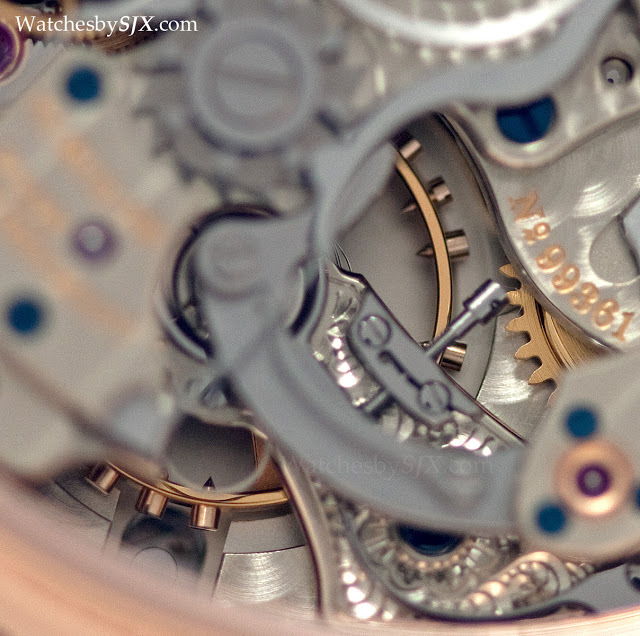 Special thanks goes to M. Hirota of Chronos Japan for the invaluable information he provided for this article.